Sandy (Sam) Ottewell moved from the interior of British Columbia to Alberta in 1999 and began fly fishing with her husband, Kevin, along Alberta’s famous west slope streams and rivers. 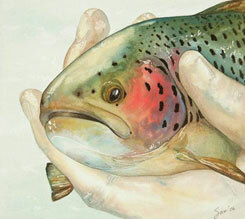 Sandy’s art realistically captures the movement and habitat of fish in water colour or acrylic. Her art has been commissioned for awards by Trout Unlimited Canada and for Ducks Unlimited and Casting for Life, and can be seen at the Terra Cotta Gallery (Black Diamond, Alberta) and the Gerry Thomas Gallery in Waterton (Alberta), as well as in fly shops and private collections. For more info visit www.sandyottewell.com.